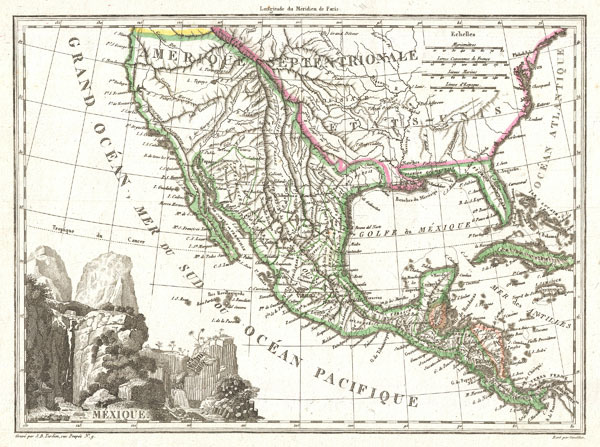 This is an unusual 1810 map of Mexico and the United States by the French cartographer J. B. Tardieu. Depicts all of Mexico and much of the United States shortly following the acquisition of Louisiana but prior to the acquisition of Florida, Texas and Upper California. This map exhibits a curious ephemeral mapping of the American Southwest based upon the Dominguez-Escalante expedition of 1776 and 1777 and Zebulon Pike's expedition of 1806. Both Lake Timpanagos (Great Salt Lake) and Lake Teguyo (Utah Lake) are appear - though both are speculative and malformed at this point. Also shows are speculative courses of the Colorado River, as well as apocryphal river ways running between Teguyo and San Francisco Bay. Politically this map is divided between the United States (pink), various Spanish holdings in North America (green), and British claims in Central America (orange). A large decorative title cartouche showing dramatic mountains, a beautiful waterfall, and some unusual rock formations appears in the lower left quadrant. Jean Baptiste Pierre Tardieu (1746 - 1816) was a prominent French cartographer and engraver working in the late 18th and early 19th centuries. Jean Baptiste Pierre Tardieu is frequently confused with both Pierre Alexander Tardieu, Pierre François Tardieu and Ambroise Tardieu, three other unrelated French map and print engravers active in the late 18th and early 19th centuries. Malte-Brun, C., Atlas Complet Du Precis De la Geographie Universelle De M. Malte Brun dressee par M. Lapie Capitaine Ingenieur Geographie, c. 1812.